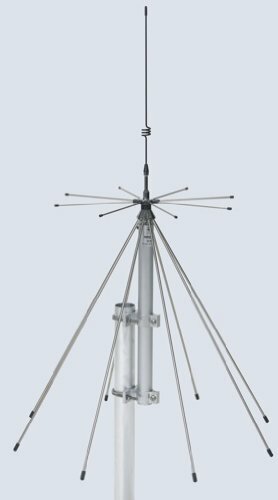 This antenna covers the frequency range of 100-2000 MHz and, due to its broadband concept, is suited for scanner and monitoring applications. This version of SD 2000 n with uhf- female connection wide-band disc one antenna working on 100-2000 MHz in reception and on many amateur frequencies in transmission (2m, 1 1/4m, 70cm, 33cm, 23cm). It is made of stainless steel, chromed brass and anodized aluminum to the best efficiency and performance. Easy to fit, it can be suitable for the installation everywhere. The vertical whip can be removed whenever the 145 MHz frequency is not required. This version of SD 2000 n with n female connection. Wide-band disc one antenna working on 300-3000 MHz in reception and on many amateur frequencies in transmission (70cm, 33cm, 23cm, 13cm). It is made of stainless steel, chromed brass and anodized aluminum to the best efficiency and performance. Easy to fit, it can be suitable for the installation everywhere. The antenna is capable also for transmit purposes, with a SWR = 2 and a transmitting power of up to 200 w, within the following ranges: 340-535 MHz 545-960 MHz 1180-1380 MHz 1660-1910 MHz 1980-3000 MHz.